Santorini, Greece is one of the most beautiful, architecturally unique places on the planet. Th e beautiful white, geometric buildings that line the hilly island’s coast act as a breathtaking signature of the country letting visitors know they’ve arrived in the Mediterranean paradise. 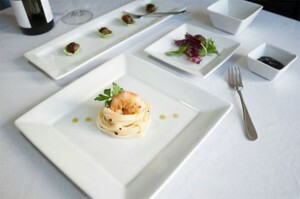 Tuxton’s Santorini Collection of geometric dinnerware provides operators with a breathtaking signature look on which they can sign their culinary signature. Inspired by the smooth-edged homes on Santorini, the latest addition to the Tuxtrendz is meant to inspire chefs and provide a culinary paradise for consumers.